Fortunately, there are data recovery tools available, which enables you to recover lost data from your computer, digital camera, memory card, USB drive, hard drive and other storage devices. Windows partitions can be easily lost due to virus infection, file system corruption and disk formatting, unexpected system shutdown, power failure, human errors, etc. Windows partition recovery is possible due to the fact that your data and partitions actually remain intact on your hard drive or storage device after deleting or formatting, until they are overwritten by other data. The sooner you notice data loss, the better chance you have of recovering that data, and the first thing to do is to stop saving files to the hard drive or storage device where the lost data was stored. When your delete or format a partition, only the partition table entry is removed and the partition remains physically intact. A deleted or formatted partition can be recovered in most cases. To do this, all you need is a Windows partition recovery tool. By using advanced scanning mechanisms, some great tools allow you to scan your entire hard drive and extract lost partitions from it. These partition recovery tools usually offer a simple, easy-to-use GUI (graphical user interface), which allows you to recover partitions within a few simple clicks. 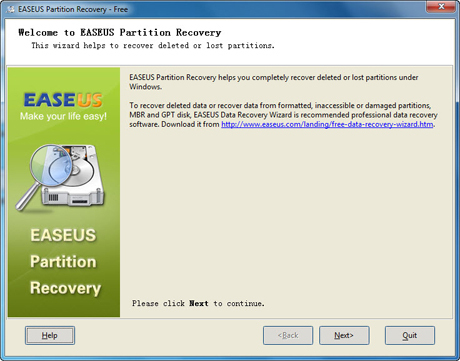 There are several partition recovery tools available from paid software to freeware, including Stellar Phoenix Partition Recovery, Active@ Partition Recovery, EaseUS Data Recovery Wizard Free Edition, and more. As always, be sure to do your research before downloading any software to be sure it is coming from a reliable software developer. Not all software on the web is well-intentioned. Following a few simple steps from one of these Windows partition recovery tools can help you restore the lost data that you though was gone forever. These tools definitely prevent the headaches of worrying about how you’ll get back important data that has been inadvertently wiped off your hard drive.